The Reviews: D’Lucky Ones is one of those oddball, low budget comedies that still fill movie theaters in The Philippines. Hollywood would never make this movie, not because Americans have so much better tastes in films, but because it now costs too much to make B films (as they used to churn out in droves). That’s television’s job. Two best friends are both avid fans of actress Vilma Santos. They know her movies by heart. When one takes a job in South Korea, they promise that her daughter will marry the other one’s son when they both are old enough. They name the girl Lucky Girl and the boy Lucky Boy after one of Vilma’s children, Luis “Lucky” Manzano. Of course they don’t consult the children, who hate each other because of an incident they both remember differently, at a party when they were both young. When the one friend returns to The Philippines with her daughter, the girl is determined to get her revenge on Lucky Boy. What follows is a typical screwball sequence of events and misunderstandings. Lucky Girl winds up staying in the same apartment with Lucky Boy, to hide out from her mother and her plans to marry the girl to Lucky Boy, and doesn’t understand who Lucky Boy is, and gradually starts to fall in love with him. Lucky Boy, however, is working hard to get his revenge on Lucky Girl. He even gets her arrested for picking flowers at the entrance to Lunetta (Rizal Park). Considering the things that go on in the park, you’d think the police would have other things to worry about besides picking flowers, but it’s funny just for that. “It’s been called the ?happiest movie? of this summer season, and indeed laughter rings out often and loudly in the movie house while “D’ Lucky Ones” is being shown. Much of the credit for the laughter and guffaws, as well as the charm and overall lighthearted feeling of the movie, goes to the tandem of Pokwang and Eugene Domingo. Playing a pair of die-hard Vilmanians (fans of Vilma Santos, for those out of the show-biz loop) who end up lifelong best friends who “pledge” their children to each other, the comediennes ham it up shamelessly and set the film’s blistering pace of razor-sharp dialog and comic antics. The two had previously made a name for themselves as “supporting” characters, comic foil to romantic leads or as “best friends” to beleaguered heroines. Most TV viewers, though, will remember them as “housemaids” in one telenovela and sitcom or another, a role that every aspirant in these parts needs to nail, it seems, before she can join the comic sorority. They might have been stuck indefinitely in this purgatory of second leads had it not been for “D’ Lucky Ones,” a movie that puts them front and center, gives them plenty of room and screen time to show off their chops, and allows them to mouth lines that parody the most memorable scenes from Ate Vi’s body of work-at once familiar and risible. 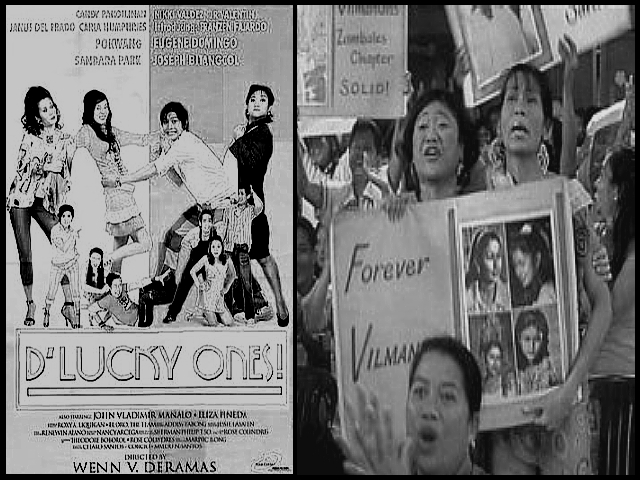 While the “lucky ones” in the movie are actually Sandara Park and Joseph Bitangcol, who play Pokwang’s and Eugene’s “Lucky Girl” and “Lucky Boy” respectively, the movie really centers around the mothers, who so dominate and beguile that I found myself distressed and bothered each time the movie left them and devoted time to the “love story” angle. I’M sorry to say that Park and Bitangcol, notwithstanding their “real-life” romantic relationship, hardly register any chemistry between them. Park is difficult to understand, since she has a tendency to let her Filipino lines run together. Bitangcol has yet to feel at ease before the camera, since his acting seems to consist mainly of poses and facial mannerisms. At times, one can even catch him sneaking a furtive look at the camera when he shouldn’t. So it’s safe to say that the movie succeeds despite them, which is why I hope producers don’t attribute any magical box-office prowess to the youngsters. Instead, they should pay attention to the newly gained clout of Pokwang and Domingo who, like Ai-Ai de las Alas, labored in obscurity before proving that screen charisma has little to do with an actor’s looks or figure, and everything to do with the ability to connect with the audience. Perhaps it also helps that “D’ Lucky Ones” takes a fond look at fandom, an occupational hazard for any consumer of entertainment fare, and the lengths fans go just to pay homage to their object of affection, adoration and adulation. The “Nora” and “Vilma” fans are particularly fascinating, since the two women commanded extraordinary levels of loyalty in their heyday and even today, no matter the intriguing twists and turns of their life stories. This entry was posted in ARTICLES, FILM REVIEW and tagged Candy Pangilinan, Charo Santos-Concio, Eugene Domingo, Guest appearance of Vilma Santos, Joseph Bitangcol, Malou N. Santos, Nikki Valdez, philippine movies, Pokwang, Rose Colindres, Sandara Park, Theodore Boborol, Vilma Santos, Vilma Tuazon, Wenn V. Deramas. Bookmark the permalink.